We hope that you will be interested in participating in this international event, which is co-sponsored by ICA [International Communication Association], the GERIICO [Group of studies and research on information and communication] and the SFSIC [French Society for Information and Communication Sciences]. It is the first time that ICA is sponsoring such an event in France, which will help us develop stronger scientific relationships between communication scholars all around the world. The deadline to submit your 1,000 word abstract is September 30, 2011. The proposals must without fail be submitted in French or in English. The main conference site is in French. Information about the conference is English is available here. The authors will get an answer at the beginning of December 2011. Please see the attached APPEL A COMMUNICATIONS CMN (US) for more details. The Mercurians, a Special Interest Group of the Society for the History of Technology (SHOT), is offering the Pam Laird Research Grant, a travel grant of US$1,000 to defray the cost of travel and housing to use a research collection. We have added this new initiative to encourage and reward high-caliber research in the history of communication technologies. One of the Mercurians’ missions is to encourage scholarship in the history of communication technologies. There is no travel grant program (either within or outside SHOT) that we are aware of dedicated to supporting scholarship on the history of communication technologies. While the history of communication technology literature is vast and always growing, the quality of the research effort or resulting publication too often falls short of scholarly expectations. The travel grant is awarded in alternating years. We anticipate presenting the first travel grant during the SHOT annual meeting November 3-6, 2011, in Cleveland. The grant is intended for and limited to junior scholars meaning either current graduate students or recent postgraduates (no more than three years beyond the terminal degree in their field). Complete the application form and e-mail it and a curriculum vitae (no longer than 3 pages) as attachments to the Mercurians. Your curriculum vitae should include pertinent publications, fellowships, or accomplishments relevant to your proposed research, and professional societies and affiliations. The deadline for submitting an application for the inaugural grant is August 31, 2011. For further information or questions, please contact Andrew Butrica. What is interpersonal communication? Is it a universal form of communication or does it vary cross-culturally? To broaden the conversation concerning interpersonal communication and culture, the Russian Journal of Communication calls for papers that will advance our understanding of Russian interpersonal communication. As guest editors for a special issue of RJC to be published in 2012, we welcome the submission of original papers on one of the following themes concerning Russian interpersonal communication: interpersonal communication in Russia or abroad; comparative studies of Russian interpersonal communication and others; interpersonal relationships (relational development, maintenance, and dissolution); face-to-face and mediated interpersonal communication and relationships; interpersonal conflict; language and social interaction; intercultural interpersonal communication; gender, ethnic, and intergenerational differences in interpersonal communication; persuasion and mutual influence in interpersonal communication; communicative competence and interpersonal skills. Papers addressing Russian interpersonal communication from any theoretical or methodological perspective are encouraged. Papers should be approximately 30 double-spaced pages including references in APA style. Please see the Journal’s guidelines for authors at for more information. The application deadline to the Fulbright Scholar Program for US Faculty and Professionals for 2012-2013 is August 1, 2011. 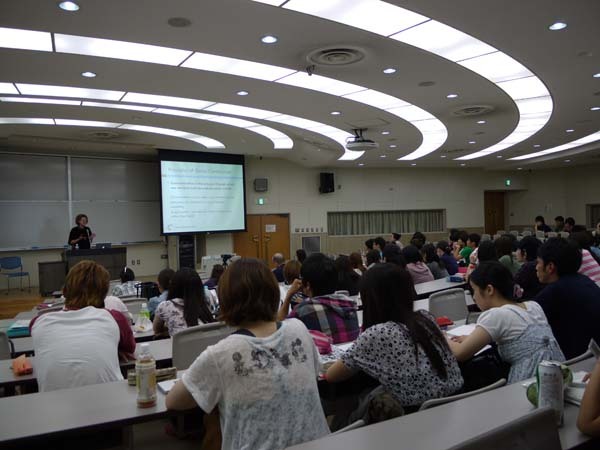 The Fulbright U.S. Scholar Program offers 225 teaching, research or combined teaching/research awards in Communications. Faculty and professionals in communications also can apply for one of our 186 All Discipline awards open to all fields. U.S. citizenship is required. For more information, visit our website at www.iie.org/cies or contact us at scholars@iie.org. Faculty and professionals are also encouraged to participate in one of our weekly webinars. For more information, visit our website at www.iie.org/cies/webinar. The Fulbright Scholar Program and Humphrey Fellowship Program are administered by the Institute of International Education’s Department of Scholar and Professional Programs, which includes the Council for International Exchange of Scholars and Humphrey divisions. The competition for 2012-13 Fulbright Scholar grants is now open. The application deadline for most programs is August 1, 2011. U.S. scholars and professionals can learn how to present their credentials at www.iie.org/cies. 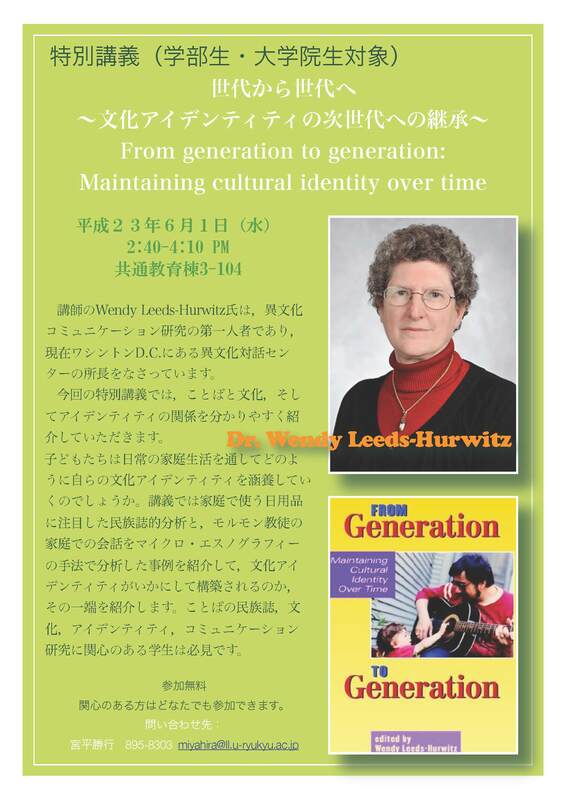 On June 1, 2011 I presented a talk to a large group of mostly students, entitled “From Generation to Generation: Maintaining Cultural Identity over Time” at the University of the Ryukyus, Okinawa, Japan. 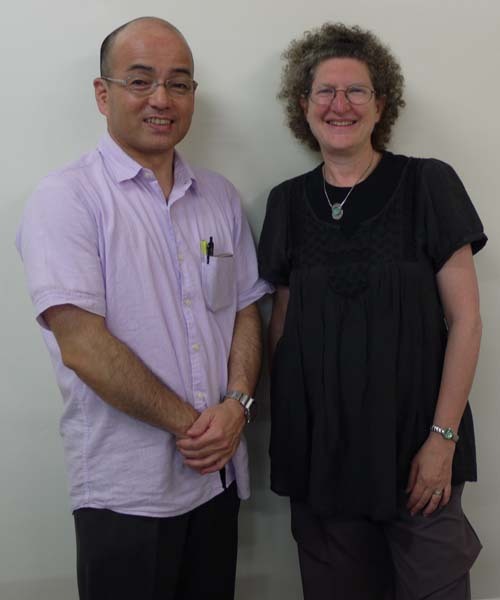 On June 2, 2011 I presented a faculty workshop entitled “Writing the Social History of Language and Social Interaction Research.” Before this event we had a faculty lunch at a local restaurant, where my husband and I were introduced to traditional Okinawan delicacies. 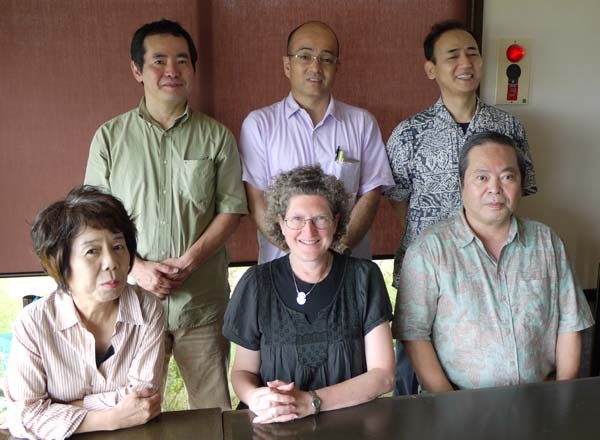 Pictured below are (back row): Professors Madoka Kanemoto, Katsuyuki Miyahira, Kenji Yoshida and (front row): Professor Hiroko Onaha, me and Professor Yasusada Uechi , all of the Department of Languages and Cultures at the University of the Ryukyus. Then, on June 3, 2011 I presented a talk to faculty (although many students also attended), co-sponsored by the Okinawa Society for Foreign Language and Literature, entitled “Socially Constructing Communication.” My thanks to Prof. Yasusada Uechi , President of the Society, for serving as the connection to the group, and to Prof. Masuo Kataoka, Vice President, for making the introduction on behalf of the Society. 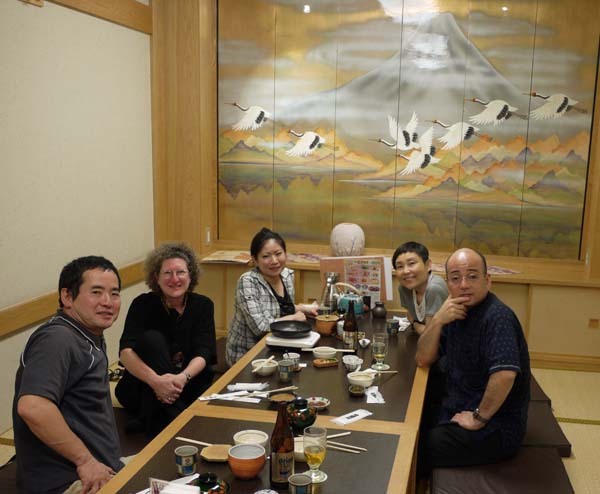 After the talk we had a faculty dinner, including Professors Madoka Kanemoto, Miki Shibata, and Katsuyuki Miyahira, as well as one student representative, Nina Arakaki. My thanks to Prof. Katsuyuki Miyahira for organizing all of these events, for inviting my husband and me to his home for dinner with his wife, Yaeko, and son, Yuta, and for the extended day exploring Okinawa, including Ryukyu-mura and the Okinawa Churaumi Aquarium. Thanks are also due to Prof. Madoka Kanemoto for a tour on a different day to Shikinaen Royal Garden and Shurijo Castle, both of which are UNESCO World Heritage sites. And to multiple graduate students: Samantha May and Yuko Naka for their guidance to local fabrics and shopping opportunities, and Yuta and Charlie for the airport runs. Okinawa was the last stop in Asia, and it was a delightful ending. I look forward to continued conversations with many of the faculty and students I met there.